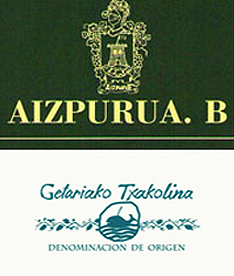 Bodegas Aizpurua is a small, family-owned and operated winery in the Txakoli de Getaria D.O. of Spain. Situated in the verdant and high mountain slopes of Meagas along the famous El Camino de Santiago, only miles from the north coast of Spain, the famiy has been growing grapes and making their wines for generations (over 100 years). Only 15 hectares of organic grapes (ranging from 5 year old vines, to 40 year old vines) produce the estate’s 120,000 bottles annually, maintaining the traditional practices of the surrounding wine region to obtain their classic Txakoli. Getaria is situated on the Bay of Biscay and is about 15 miles west of San Sebastian covering an area of 800 acres. The views surrounding Getaria are amazing. You have an old town, a mountain that is an islet, a port, beaches (Gaztetape and Malkorbe), the ocean, and the rolling green hills of the Getariako Txakoli wine region. The Getariako Txakolina wine region consists of 18 vineyards (Bodegas), which produce 1.5 million liter of wine annually. The vineyards that produce Txakoli de Getaria-Getariako Txakolina are grown on the arbors that line the green slopes of Getaria.